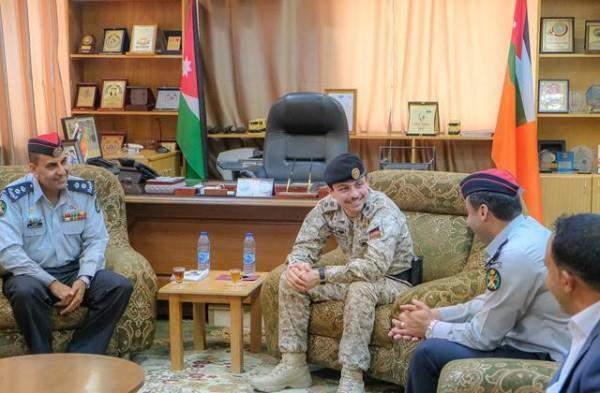 (MENAFN - Jordan Times) AMMAN — HRH Crown Prince Hussein on Monday visited the Aqaba Civil Defence Department (CDD) and met with a number of its personnel, a Royal Court statement said. Crown Prince Hussein listened to a briefing by Aqaba CDD Director Lt. Col. Muhammad Majali on the duties and services of the department. The Crown Prince commended the 'advanced level' CDD personnel have realised in terms of preparedness, rehabilitation and field performance. Crown Prince Hussein also pointed to the recent tactical drills CDD implemented in Aqaba, in cooperation with specialised military and civil institutions. He underlined that such cooperation increases the levels of efficiency, preparedness and partnership among the respective national institutions. The Crown Prince added that it contributes effectively to attaining the desired level of coordination and readiness that His Majesty King Abdullah, the Supreme Commander of the Jordan Armed Forces-Arab Army, always calls for. King Abdullah and Crown Prince Hussein attended the Aqaba drills on March 16, where Crown Prince Hussein participated in rescue operations using ambulance boats which were recently introduced into service under Royal Directives. During the drills, paramedics, firefighters, a hazardous material response team and a search-and-rescue team worked in cooperation with specialised civil and military agencies to deal with a simulated incident. An MI-26 helicopter was also used to put out a fire and evacuate the injured.